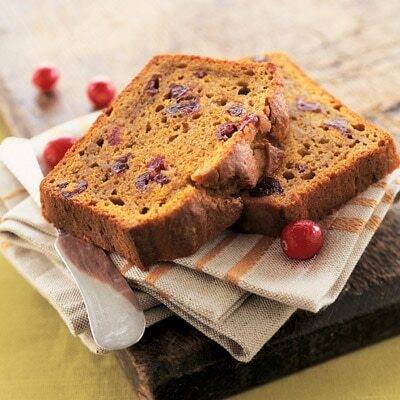 Enjoy this irresistibly moist and flavorful LIBBY'S® Pumpkin Cranberry Bread. Delicious for breakfast or snack. One batch makes two large loaves; one for now and one for later. Or bake into mini loaves. They make great gifts for teachers, neighbors and friends! COMBINE flour, pumpkin pie spice, baking soda and salt in large bowl. Combine sugar, pumpkin, eggs, oil and juice in large mixer bowl; beat until just blended. Add pumpkin mixture to flour mixture; stir just until moistened. Fold in cranberries. Spoon batter into prepared loaf pans.